A cataract is clouding of the natural lens of the eye. The lens is located behind the pupil, which appears as a black circle in the colored part of the eye, or iris. The figure above illustrates a very dense cataract. These symptoms can be caused by other eye conditions as well. Only your eye doctor can tell you if your symptoms are caused by cataract. Your doctor looks at numerous things to diagnose cataracts and assess their impact on your vision. - Visual acuity testing, or the clearness of vision on the eye chart. - Refraction, or checking for glasses: As cataracts grow, they can cause small or sometimes large changes in the glasses prescription. - Slit lamp and dilated exams: A cataract is best examined through a dilated pupil. This allows visualization of the different layers of the cataract. Sometimes your doctor will perform vision testing through a pinhole or glare testing to better assess the severity of the cataract. The lens (where cataracts grow) is made of water and protein. As we age, the proteins can change, causing cataract. 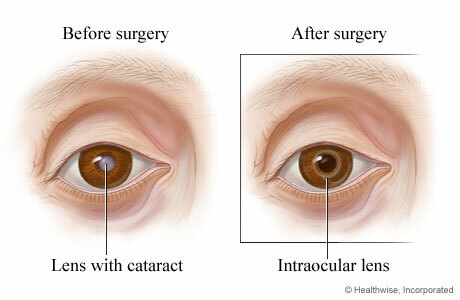 addition, cataracts can be associated with other eye conditions, such as inflammation inside the eye. Initially, the visual changes caused by cataracts can be treated with new lenses, brighter lighting or anti-glare sunglasses. However, when these do not help, surgery is the only treatment for cataract.